When history is told the battles get the headlines. The victors determine how the story gets told and to some degree what stays in and what gets edited out. It’s a simple model – you fight, you win and quite naturally you then write about how and what you won and how jolly brave you were along the way. Tony Blair’s having a go with his memoirs right now – you don’t suppose he’ll not take out the bits that don’t suit, do you? When history hits paper, the writer probably doesn’t write about what his wife/mother/sister/aunt were doing or thinking about whilst he was off yomping around with a big weapon. The focus is on war-craft, cunning victories, derring-do and acts of great bravery. History is testosterone-charged all the way and literature isn’t much far behind. As for the women, they stay home, stay faithful and stay true to the memory of their missing men. Mostly! What would happen if instead of the ‘Boys Own’ comic-book view of the Trojan Wars, someone took a look at what was going on back home? Step aside Odysseus, it’s Penelope’s turn to tell us her version of life on the home-front during all that palaver with the big wooden horse. Let her tell us what she was going through whilst she was waiting with interminable patience for her sea-faring adventurer to stop mucking about with the wars, playing with Sirens (the singing mermaid type, not the nee-nah blues and twos) and getting seduced by goddesses. I did Latin at school, not Greek so I know bits of Virgil’s Aeneid but very little of Homer’s Iliad. I do know however that it’s very long – stretching to 24 books. 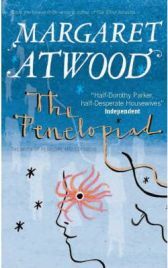 Thankfully Margaret Atwood is more concise and keeps the Penelopiad to just one book. I knew only the very barest bones of the plot of Penelope and Odysseus. If I am honest, the little I knew wasn’t from Homer but from another modern re-write of the tale of Ulysses which was rather more sympathetic to the big fella and his philandering wife-abandoning ways than the Penelopiad was. For those not so familiar, the ultra-brief version of the story goes thus. Penelope was the daughter of King Icarius of Sparta and a Naiad (or water nymph-type thing). Neither Spartans nor Naiads are known for good childrearing skills and they married her off to Odysseus when she was 15. She was a bit like a poor marriage consolation prize fought over by the men who didn’t succeed in their quest to win her flashy egocentric cousin Helen (she who ran off with Paris and started all the trouble in Troy). Odysseus was tough and accomplished but had rather short legs (the kind of thing a wife might notice more than a battle commander might). Penelope and Ulysses had a son, Telemachus, and for the purposes of Margaret Atwood’s treatment, Penelope’s a woman with rather more to offer than the two-dimensional Penelope of Homer. What’s a girl to do? When your husband goes off to fight alongside your cousin’s hubby to bring back the run-away Helen and rescue the family reputation, he doesn’t seem to spare too much thought for you, your baby and the enormous household you have to run back in the Kingdom of Ithaca. Rather than rushing back to help with the chores, Odysseus finishes off the Trojan wars and then takes rather a lot of detours on the way home. Penelope’s waiting with only her handmaids for giggly girlie company and there’s a line of gold-digging young suitors outside her door that’s growing longer the more years her husband stays away. Penelope’s getting eaten out of house and home by all these wannabe-husbands. Will Odysseus ever get back? How can she put off choosing a new husband? And just what’ll be left of the family fortune? I love Margaret Atwood and have done for over 25 years. From the first of her books I picked up (the relatively forgettable Lady Oracle) through her dystopian Sci-Fi classic like The Handmaid’s Tale and her post apocalyptic vision of Oryx and Crake and her multiple prize winning books like Alias Grace or The Robber Bride, everything Atwood touches turns to awards and nominations. She has always been a dependable source of a great read but not always a great wit. Her writing tends more towards intellect rather than humour but you get the impression reading the Penelopiad that she’s having fun and making some important points about the male dominance of historic record. Some readers have accused some of Atwood’s books of sometimes dragging just a little bit. There’s no fear of that with the Penelopiad which at just a shade under 200 pages and with a very liberally use of white space on the page is scarcely more than a novella. You can romp through it in a few hours. It’s funny, shocking, tragic and likely to make you feel glad you live in an era where your rich parents won’t sell you to the biggest bravest chap or your poor parents won’t sell you into slavery. One Comment on "The Penelopiad"